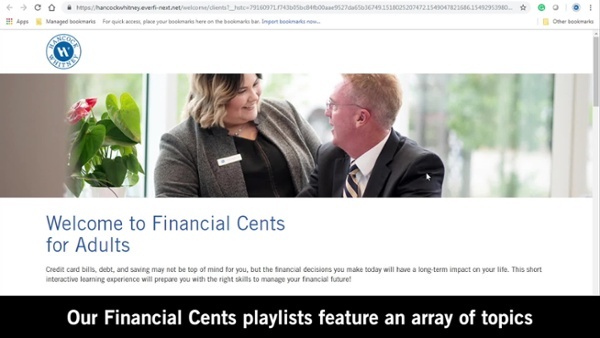 With courses less than 10 minutes each, Hancock Whitney Financial Cents for Adults lets users learn at their own pace from specialized playlists focused on financial topics important to most adults. This customized pick, click, and play experience helps adults better understand basic money management concepts and enhance what they know about investments, savings, taxes, checking accounts, credit cards and scores, mortgages and home ownership, estate planning, retirement, and other popular subjects. Watch this short video below to see how simple it is to use and benefit from this new free financial education resource and public service from Hancock Whitney. We’re a company that never knows completion—always striving to be better for people and the communities we serve, We also believe financial education should be ongoing, a life-long learning process to help people make educated financial choices for important junctures in their lives based on the fundamentals of good financial habits. Hancock Whitney Financial Cents for Adults aligns with our financial education philosophy, mirrors our mission and purpose, and complements the expertise our bankers share with clients. It’s also part of our comprehensive Financial Cents financial education program, which includes the Hancock Whitney Financial Cents for Students computer based modules educators use to reinforce classroom instruction and state requirements, in-person presentations by local bankers, and lessons built on FDIC and state banking association curriculums. Life moves quickly and changes often. Knowledge—especially financial knowledge—helps us plan, adapt, and stay on course toward our goals. With that wisdom, we can also become more confident about decisions we make about our money and the opportunities we work to create for those who depend on us. As we introduce Hancock Whitney Financial Cents for Adults, we’re pleased to provide one more way to help make your financial dreams real.